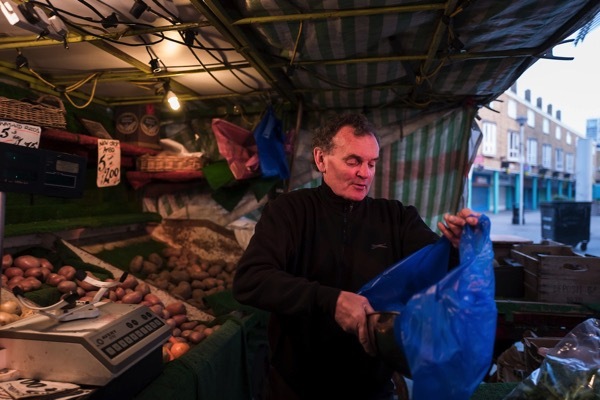 Photographer Andrew Baker introduced me to his pal Kenny Long at Chrisp St Market in Poplar. 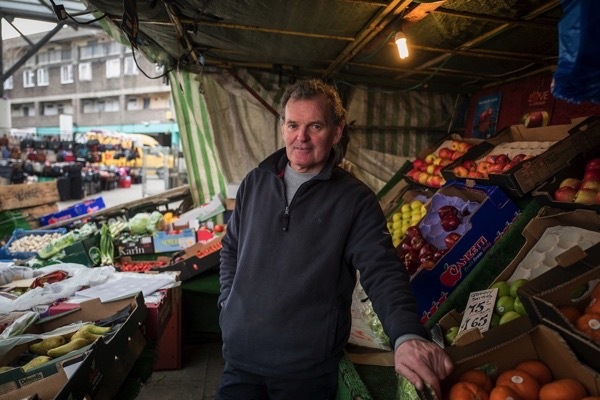 Ken is an heroic greengrocer who sets up his stall earlier than anyone else each day and whose family have been trading in this location through four generations, since before the current market was even built. 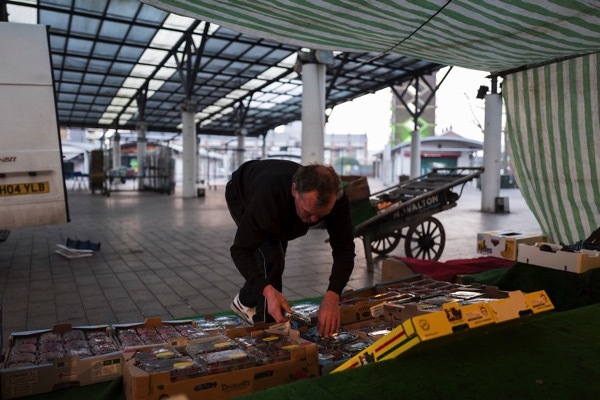 Ken sets up in the dawn, after he has been to the wholesale market to buy fresh produce, wheeling out the old wooden barrows and arranging his stall in the traditional manner with the vegetables to the right and the fruit to left, just as he has done for the past thirty years. 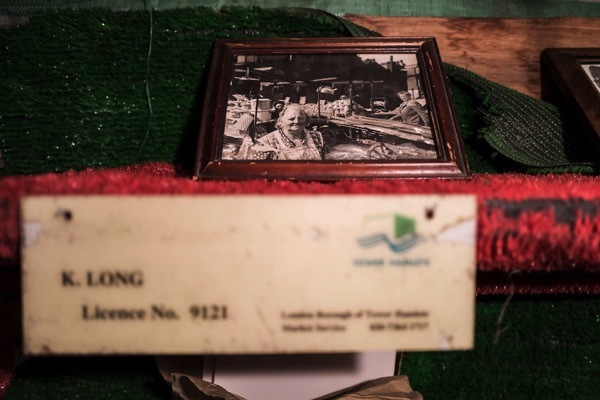 Black and white photographs of those who precede him are set upon the stall each day as a constant reminder of this long-standing family endeavour, which Ken maintains through his daily ritual out of loving devotion to those who are dead and gone. 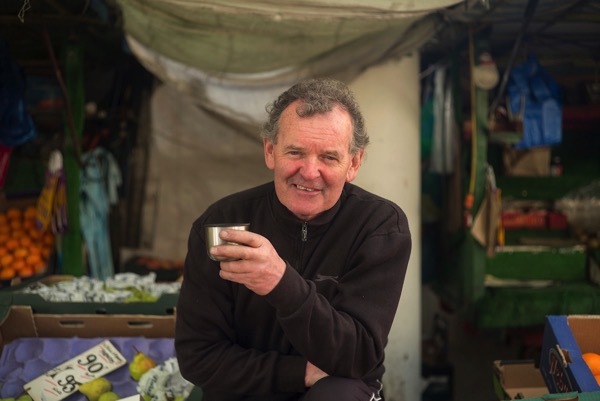 While we chatted, Ken popped across the square to place a few bets on the horses, as he does every day, and our conversation was interrupted by long-standing customers coming to buy. 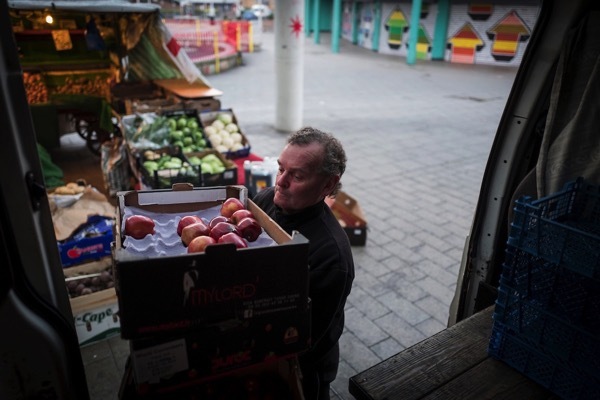 Although Ken still makes a good living and his work keeps him fit and wiry at sixty-one years old, I learnt from him that being a greengrocer is a way of life and a way of understanding the world, as much as it is a business – as much culture as it is commerce. 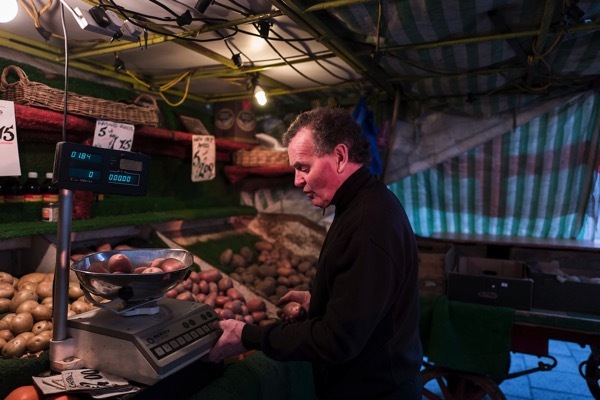 In Chrisp St Market, Ken Long is the overseer of time passing and the custodian of history. 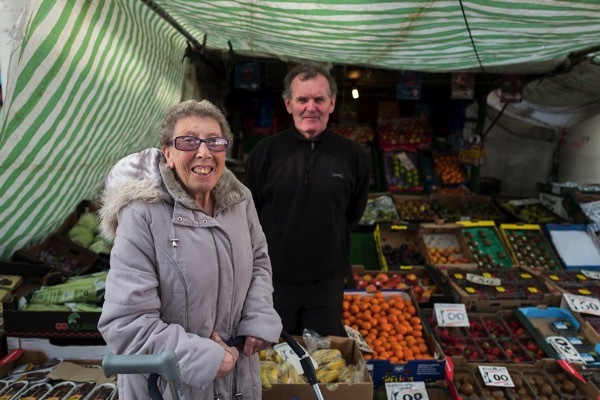 “It all stems back to before the Second World War when my great-grandmother, Ellen Walton – old granny Walton they used to call her – she had a greengrocer’s shop in Violet Rd in the thirties. My great-grandfather was a merchant seaman and in those days you could bring anything home, and he brought my mum a monkey and they used to have the monkey swinging about in the shop. 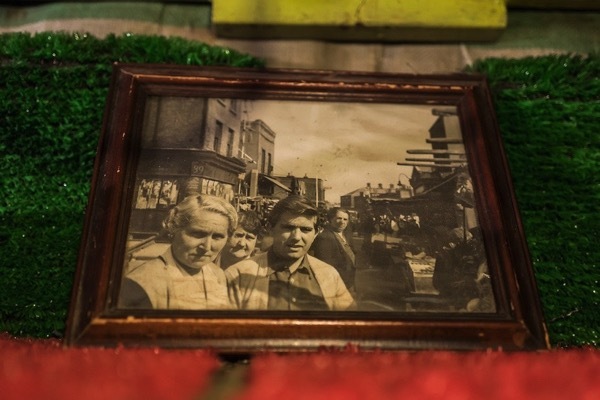 When the shop got bombed during the War, they moved onto a stall in Chrisp St Market. 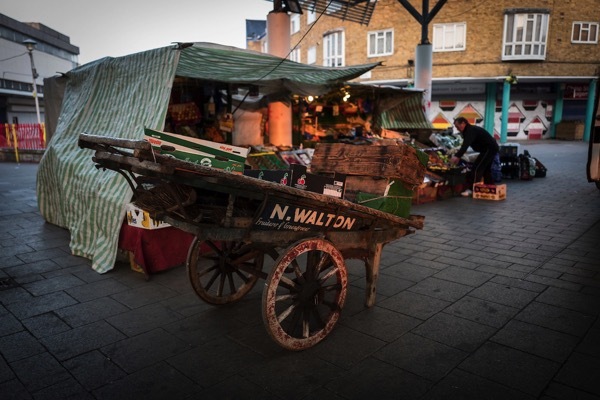 Old granny Walton passed the business on to my grandmother, Nell Walton – her name is on my barrow – and from her it went to her son, Freddie Walton and his sister, my mum Joanie Long, worked on the stall fifty years. 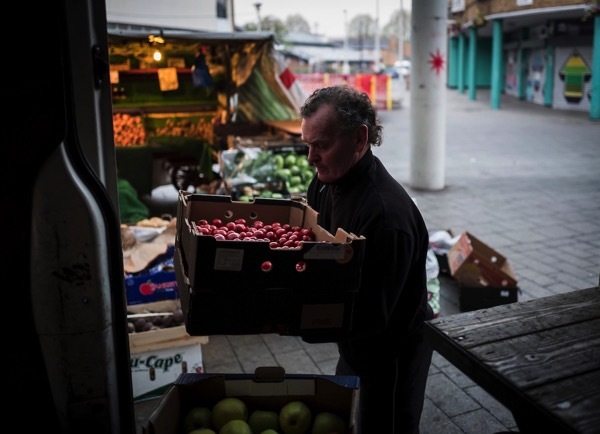 In 1951, they moved into the Lansbury Market ( as it was then) on the newly-built Lansbury Estate and we’ve been here ever since. When Uncle Freddie passed away two weeks after his sixty-fifth birthday, my mum took over. By then, I was already working on the fruit stall. My dad, William Long, was a docker and he died when I was eight in 1965. He got killed in the docks. 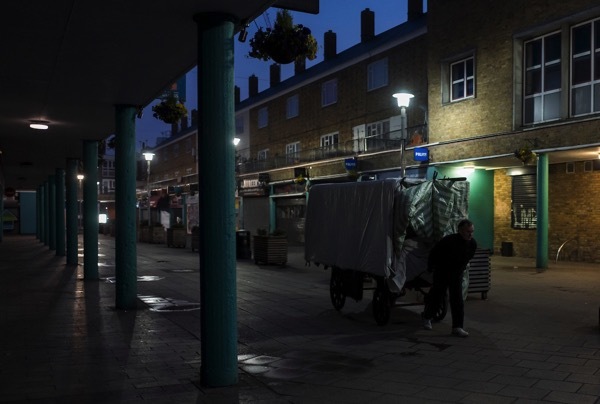 As a child I was up here all the time, I used to come up to my nan on a Saturday and I used to run around the market. I would stay with my nan on a Saturday night and my dad would come and pick me up on a Sunday morning and take me home. Eventually, I took the stall over from my mum and the licence changed from my uncle into my name but - as far as I was concerned – as long as my mother worked here, she was in charge because I had to do what I was told. 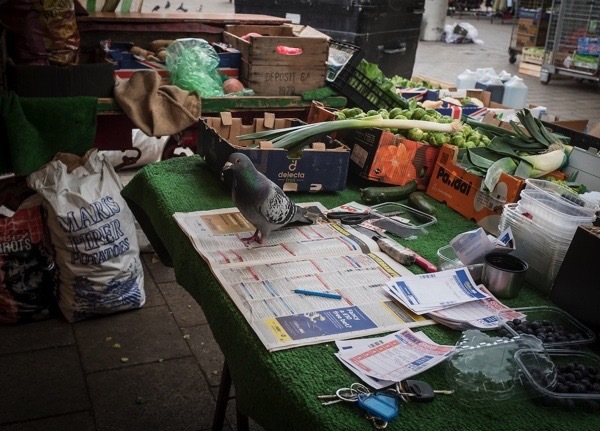 At first, I got involved with the vegetable end of the stall, which my aunt used to run with my uncle until she had to have her leg off and couldn’t do it no more. My uncle was going to rent it out but I overheard my mum talking about it and I said, ‘Don’t rent it out to no stranger, keep it in the family. I’ll try it for a couple of years and see how I go’ - and the rest is history. I was thirty-one when I started and this year it will be thirty years that I have been here. When I started, my uncle let me have the vegetable end of the stall and work it for myself, and I gave him the rent to pay to the council. After about two years, he dropped down dead indoors so we shut the stall up for a week and I had to decide what I was going to do, and I decided to take it on. 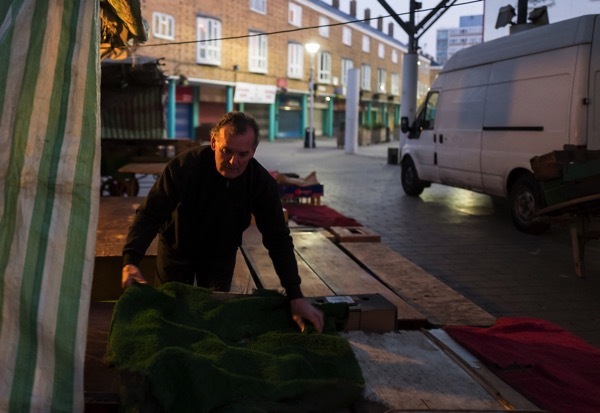 I had been up to the Spitalfields Market with uncle and seen what he bought and what he didn’t buy. There were four of us working here then – me, my mum, my daughter and a girl. You needed at least three then, but now trade is not what it used to be, so I get by on my own. For a while now, my stall has been the longest-established here in the market. We’ve been here everyday, every week for as long as this market has existed. Traditionally, people bought their bread, their meat, and their fruit and veg for the weekend on a Friday. Everybody used to cook a roast dinner on a Sunday but there’s not a lot of people that do that anymore. We had customers queueing up from half past six – seven o’clock in the morning and we’d have a queue at either end of the stall. They’d buy their vegetables at one end and pay for them, and then go up to the other end and queue up to buy their fruit. My mum would be serving here, I’d have a girl serving there and I’d be serving in the middle. It was like that all the time, from seven in the morning until four in the afternoon. People who knew me would say, ‘Ken, you know what I have.’ Ten pounds of potatoes, a cabbage, a cauliflower, carrots, onions and parsnips – the whole lot for their roast dinner. Now you get customers who come on a Saturday and ask for two pounds of potatoes, a carrot and a parsnip just to get them by. Working like I do is a dying trade, serving customers individually and weighing out fruit and veg. 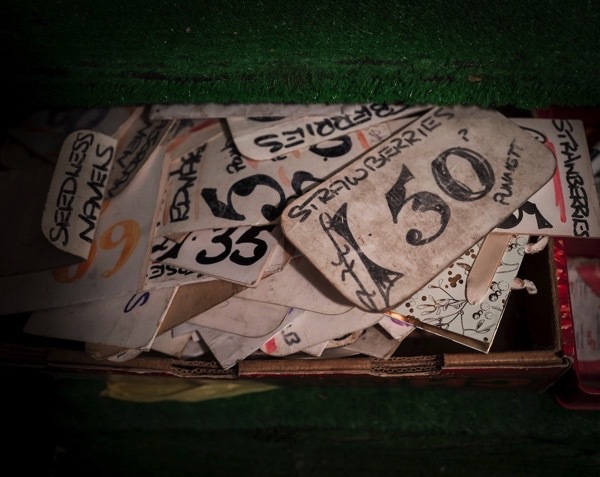 On the other stalls in this market and you’ll see ‘pound a bowl’ and ‘pound a bag’ - everything is pre-packed. 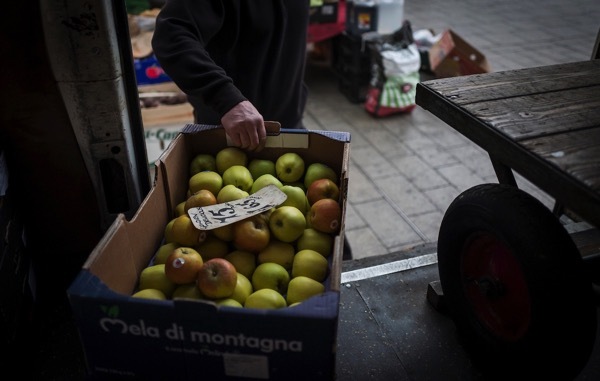 I am a traditional greengrocer and, although I can get everything all year round now, I know when the seasons are and I know when to buy, and there’s times when I won’t buy certain things because it ain’t proper. 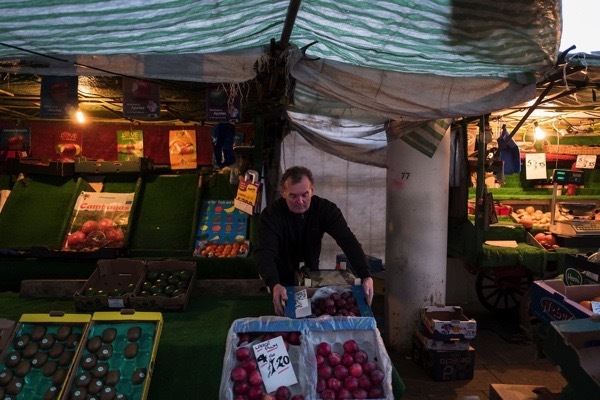 I known greengrocers who have worked in Roman Rd, Watney Market, Bethnal Green and Rathbone Market, packing up and nobody ever replaces them, whereas once upon a time it was family and people came in to the business, taking over from their mum or dad. That’s not happening now. 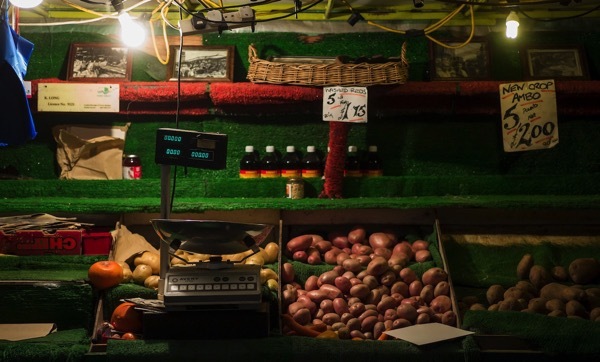 You don’t have to serve an apprenticeship, you just have to go the wholesale market with whoever you are going to take over from and you have to have some experience to know what you are selling. There’s ten different oranges I can buy, but I know to buy seedless Spanish navels because they are best oranges. 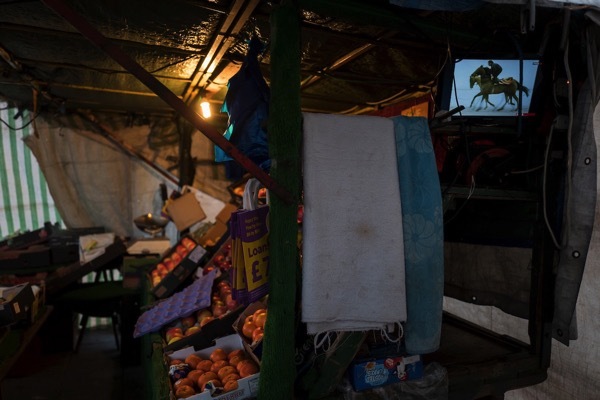 Elsewhere in this market, you can buy cheaper oranges and people think it’s better value, but only because they do not understand what they are buying. The soft fruit I sell will ripen nicely, whereas much of the fruit you buy in a supermarket will not ripen until it rots because they select varieties to have a long shelf life. You don’t always buy with your eyes. Most of my regular customers know me and they say, ‘They look lovely, what are they like?’ and I’ll say, ‘Don’t have them, have these.’ I’ve been doing this long enough to know which people will trust me. I look after my loyal customers. 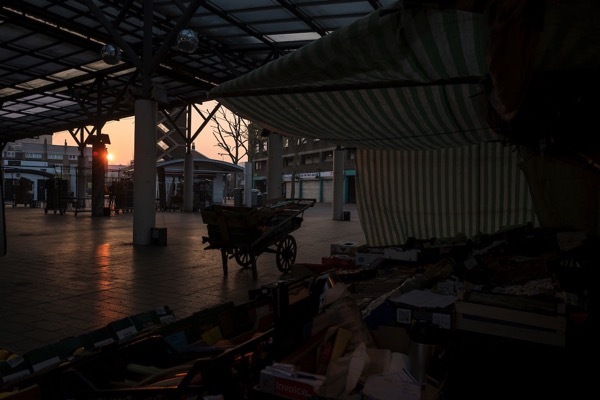 In the last couple of years, they have been refurbishing the market and everything is coming down for redevelopment, so when that starts I am going. 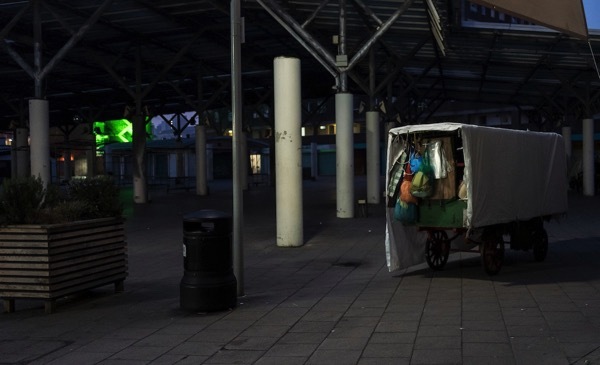 I’ve got two sheds round the corner which I put these stalls in every night, they’re coming down first before the work starts, so that will put me out of a job. There’s nothing I can do about it. I’m being pushed out but it suits me, I’m sixty this year. I’m trying to find reasons to go. They’ve offered me alternative accommodation but it won’t be in the vicinity. It only takes me fifteen minutes to pull all these stalls round every morning at present. We’ve had these old barrows hired off Hiller Brothers since 1951 when we came into the market. I pay thirty-seven pounds sixty per month, it never goes up and they maintain them for me at no extra charge. I’m doing my own thing here. Since my mum’s been gone, and my daughter’s been gone and the girl’s been gone, I can do what I like! As much as I was running the stall, doing the buying and sorting the money out, when they was here I was still ‘the boy.’ It was still - ‘Ken, make us a cup of tea!’ -’Ken do this!’- ’Ken do that!’ – ‘Ken, go round the shed and get some orders’ There was three women telling me what to do. It was lovely and I did it because I thought I was supposed to, so I didn’t mind. I’m still serving people I have served for thirty years but I have new customers come along too. I like the variety. I like being outside. I prefer the winter to the summer, because I don’t want to be here in the summer I want to be somewhere else nice. The hot weather doesn’t help all this stuff, you have to careful what you buy and how much you buy – it makes the job a little but harder. 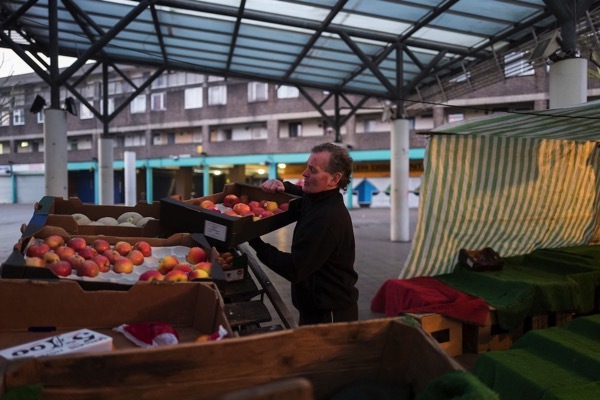 In the winter, you can buy a little bit more because it will keep an extra day or two, and in the winter you sell an even amount of fruit and veg, whereas in the summer you don’t sell a lot of veg because people don’t eat so many hot dinners. What a hero! The recent stats that suggest our shopping patterns are starting to revert to small and often purchases give a tiny hope that Tesco et al won’t have it all their own way, thank goodness. Lovely story. Interesting to read. Thank you. What a man ! ..a credit to to his family and the East End. Kens story and comments about change and conflict with super markets as well as changing shopping habits are fair and honest. I salute you Ken and i am sure i speak for all East Enders .. not just for the Poplar people. …Cheers mate. What admirable dedication and (dare I say) true grit. tradesman. Ken’s array would be a show-stopper at any produce market in the world. You folks are very fortunate to have him. Well done Ken ! I can smell those beautiful vegetables and fruit, makes me want to cook a delicious meal. You are a treasure (yours is a labour of love) and I wish I could purchase your produce. It is dedication like yours what life is all about, you are inspiring and admirable. 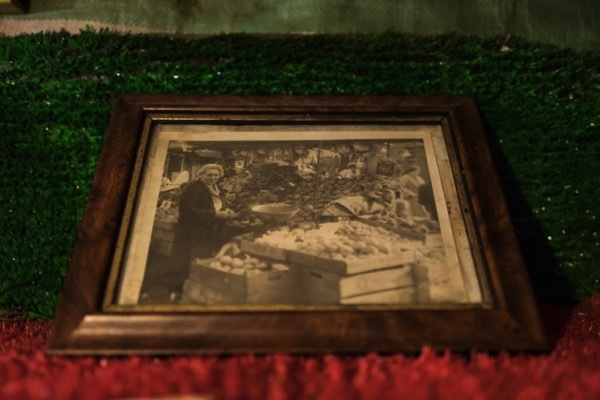 When I need some inspiration to cook a lovely meal, I will look at the photos of your stall! and I will think of you out at dawn as I turn over and snuggle up after my two Siamese awake me for their breakfast. Thank you! 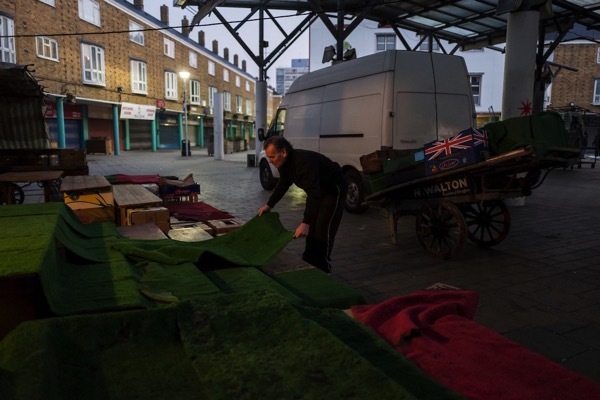 what a great story and all that east end history ,sadly soon to go. 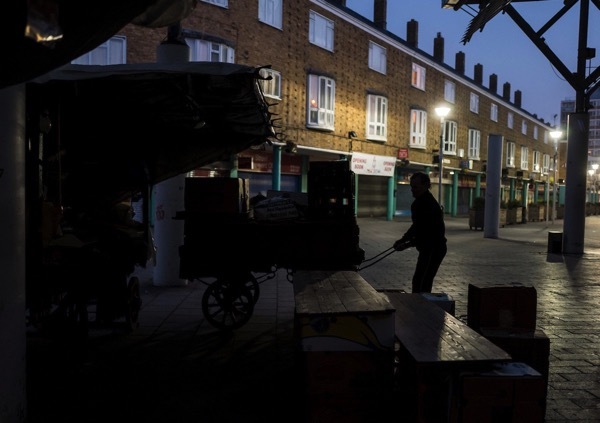 I remember Bethnal green market, going with my mum to buy the shopping we had fish most Fridays and a roast on Sunday ,your last chance to buy anything was Saturday as all the shops were closed on Sunday ,they should bring that back …anyway a great read . I do love these pen portraits GA. They tell us so much about social history and what love, care and hard work people put into their jobs. This portrait is no exception and I have huge respect for Ken Long. 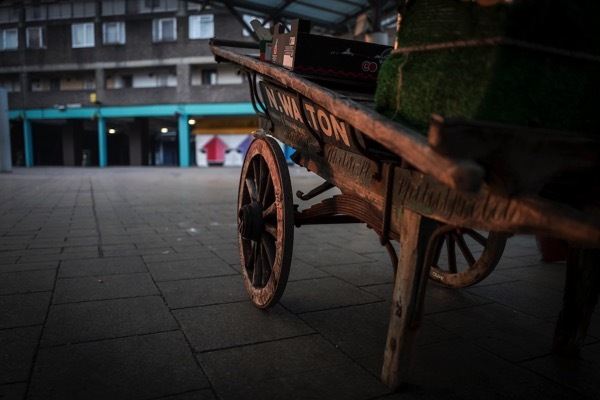 Great photos too from Andrew Baker and oh those lovely barrows! 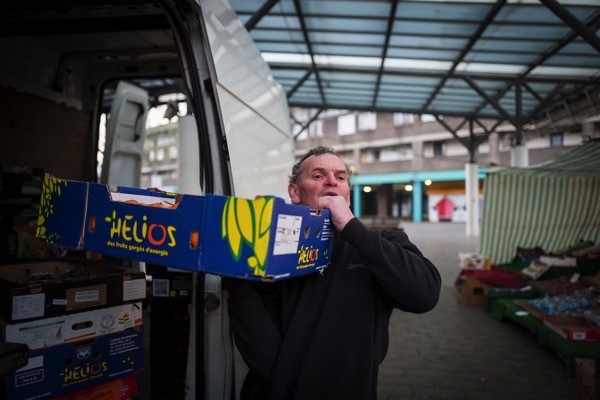 Sadly Ken is leaving the market on 31st March 2018, an end of an era. Very sad to see you go Ken, I hope you enjoy your retirement as you deserve it. 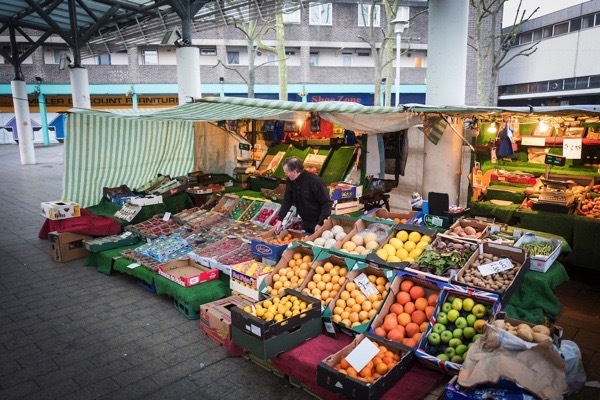 You are the only stall left from the old market We will greatly miss you and appreciate your long standing.